After much marketing secrecy and controlled photo releases, three new Echo 1 models have been released, the ER25K, M4 CQB XK, and this model, the Stag Arms M8A3. Two of these models are AR variants and the other is an SR25 based gun. These models are some of the finest models to come out of Echo 1 to date, and I am pleased to be reviewing the M8A3 here today! The M8A3 isnâ€™t an actual AR variant, but has features from several different guns all rolled into one. It is, however, licensed through Stag Arms, whose history I will showcase here. Stag Arms is a real steel firearms manufacturer whose products are regarded as one of the better options out there for ARs. They manufacture guns for both right and left handed users in a variety of calibers. 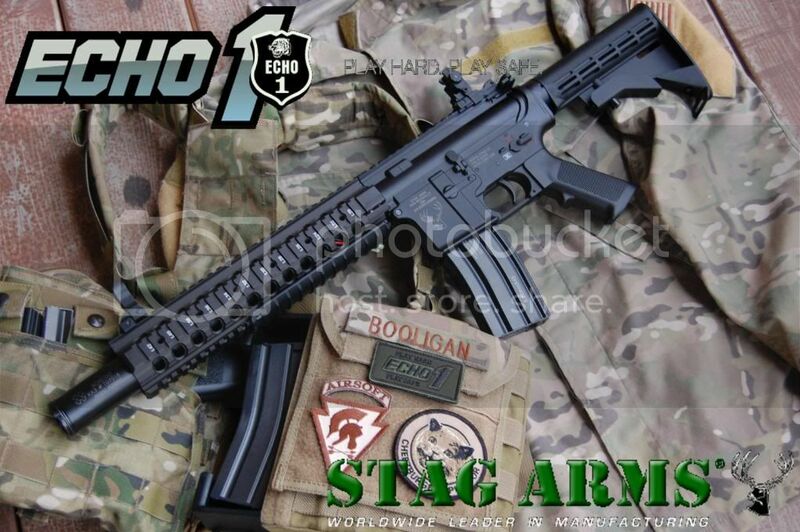 Echo 1 has been licensing AEGs with the Stag Arms name for about a year. 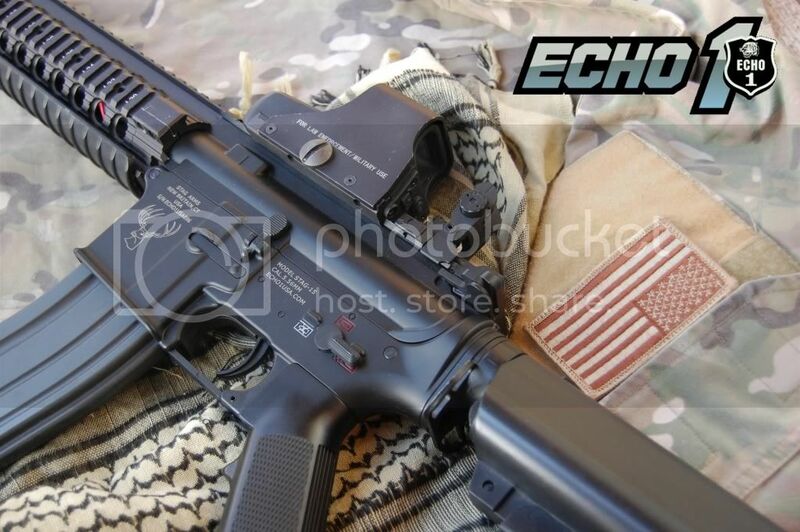 I was sent this AEG directly by Echo 1 USA in order to review it here on Airsoft Retreat. It is currently available at most major airsoft retailers priced at $210. It includes Echo 1â€™s 30 day warranty against manufacturer defects. This gun is a nice little collection of parts thrown into one very attractive package. It has elements of the H&K 416, as well as a standard M4, and some Troy Industries manufactured models. It has a plastic receiver which is both lightweight and rock solid. There is a lot of metal on this gun, however, and it shouldnâ€™t be shot down because of the plastic receiver. The M8A3 arrived in a nicely decorated box showing that it is a Stag Arms model, as well as showing basic information on the gun. I was very pleased that it came with E1â€™s new soft foam packing system, which takes the abuse of shipping much better than the plain white styrofoam, and makes for a very nice presentation. Included in this package is the gun, 8.4v 1500 mAh battery and charger, battery box, one metal hi-cap magazine, winding tool, front sight adjustment tool (that canâ€™t be used on this model), cleaning/unjamming rod, manual, and the warranty card. As mentioned previously, this gun has a plastic receiver, but has a lot of metal parts. The metal parts include the stock tube, free float RIS, convertible outer barrel, top rail, front and rear sights, and all the various switchgear (trigger, selector switch, etc). The stock is a standard 6 position LE stock. Nothing too special here, except for the fact that it is a very snug fit, and thereâ€™s very little stock wobble on the buffer tube. There is a slightly visible seam line on the top, but itâ€™s not easily felt. There is also a metal sling mount located at the bottom; like all LE stocks. The receiver is plastic, but itâ€™s not a standard M4 receiver. The lower receiver is an HK416 style receiver, with the flatter magwell angle and HK style pictogram selector markings, which are molded in and painted. The upper receiver is a standard M4 style, which lines up flush with the RIS. A 416 upper receiver wouldnâ€™t line up with the Troy industries FF RIS. As mentioned earlier, all the switchgear is metal, and functions quite well. Pulling back the metal charging handle opens the dust cover, pulls back the mock bolt carrier, and exposes the hop-up adjustment dial. The dust cover can be clicked firmly back into the closed position when not in use. The grip is a normal M4 style grip. It has all the standard checkering for a solid grip, and is devoid of any negative seam lines that can be felt. The base has an allen head adjuster which is marked â€œMade In Chinaâ€. The RIS is a replica of the 10â€ Troy Industries style of free float RIS, although itâ€™s actual length is about 10.8â€. It is a free float design, so it doesnâ€™t touch the barrel at all, nor does it require the use of a gas block. This helps accuracy and frankly just looks nice. Itâ€™s a monolithic style of RIS, which means that it sits flush with the receiver top rail and offers one long RIS surface with no breaks for delta rings or anything of that sort. Itâ€™s attached by a piece at the bottom of the RIS, which is secured by 4 allen head screws. This thing is rock solid on the gun, with absolutely zero wobble or creaks. There are laser engraved mounting numbers on all RIS faces. The outer barrel is a â€œone pieceâ€ design, meaning there are no separate parts at the base to cause wobble. It is in actuality, a 2 piece design, as it includes a removable piece to make the barrel length either 10â€ or 15â€, not counting the flashhider. With the extension removed, there is a 14mm- threaded muzzle right inside the RIS, perfect for mounting a muzzle device in the shortened state. There is no replica gas block on this gun. The orange tip on the thing is not just screwed on, but secured by an allen head screw, a pin (that I canâ€™t think of how to remove), and glue. I have no clue whatâ€™s underneath, but my guess is 14mm- threads once you get that damn thing off. Aiming this beast is accomplished with the use of folding metal back-up iron sights. The front is a replica of a Troy HK Style Folding Battle Sight, and the rear is a replica ARMS #40L folding sight. The rear is adjustable for windage using no tools, and the front is adjustable for elevation using a special tool thatâ€™s not included. On mine, the front sight would not lock open, causing it to spring closed when firing. I solved this by grinding a little bit of metal off the front of the sight itself, allowing it to go a bit more forwards, locking it securely. Now, where do you put the battery in this thing? Unfortunately, you have to use an external battery box, which is included. It is plastic and will hold a large 8.4v battery with no problem. It is pretty bulky, unfortunately. Iâ€™ll be rewiring mine to the rear with either a crane stock or a VLTOR MOD stock. Overall, Iâ€™ve forgotten that this thing has a plastic receiver. Seriously. I donâ€™t see it as a detriment in any way, shape, or form. The RIS is amazing, the sights are great, and overall, itâ€™s an awesome gun externally. One of the perks of this gun are the licensed and legal Stag Arms trademarks. This model features a bunch of trades, all tastefully engraved in the gun. As mentioned earlier, the selector markings are engraved and painted, and are the HK style pictograms. The included magazine is a metal hi-cap, holding 300 rounds. It fits and feeds very well, and features a hole in the side for rapid winding using the included butterfly key. Mag compatibility is pretty basic. Everything that Iâ€™ve tried (TM, Dboys, AGM, A&K, E1, JG, MAG, ICS, SRC) have all fit and fed perfectly, with the exception of one. ICS Thermold mags will not fit, due to the flatter magwell. I can see this causing issues with Thermold mags, as well as some box/drum/Cmags. Accuracy and range was good, considering the size of the inner barrel. The Madbull bucking works wonders with the 300mm length barrel, allowing me to hit a man sized target at 155' 90% of the time, using TSD .25g BBs. I recommend heavier weight BBs in the .23-.28g range, due to the somewhat high velocity as well as the ability to apply plenty of hop-up to maintain range. I ran it at a game for several hours with the lipo, and it took it like a champ. No major misfeeding, no broken parts, no problems. Internally, this thing has pretty solid guts, including a chrome type 1 cylinder, metal non-bearing spring guide, and a very high torque motor. It also has metal bushings that appear to be 6mm in diameter. The piston is orange and appears to be the same design as the newer Systema piston. The piston head is ported and is made of an off white polycarbonate, which is the same as the cylinder head. The compression is very good, only allowing a tiny amount of air to leak past the piston o-ring. The gears are marked "GE", and are attracted by a magnet, leading me to believe that they are made of steel. The shim job was the best I've seen yet on an ACM gun, and the gearbox was lubed only slightly too much. The wiring is nice and thick and has a fairly high strand count from what I can see, and a 25A automotive style blade fuse is hidden in the RIS. It has a two piece plastic hop-up, and is equipped with a blue Madbull bucking from the factory, with a standard nub. This combo has impressed me since I first encountered it in the E1 P90. The inner barrel is 300mm in length, meaning it comes right up to the muzzle of the short outer barrel, making it perfect for short carbine buildups. This thing is BEGGING to be modified. Mine has already had a Noveske KX3 Firepig flashhider added, and will be getting rewired to the rear with either a crane or VLTOR MOD stock. You have lots of options, since itâ€™s basically an M4, plus you have a ton of rails for accessories. Go nuts modifying this one. I even tossed on the Zombat strike face on it, and it fit perfectly. I wasnâ€™t expecting too much with this gun, but I was wowed by the total package. Itâ€™s really worth more than the sum of its parts, both in cost and in style. Itâ€™s a very unique gun thatâ€™s ripe with mod possibilities.